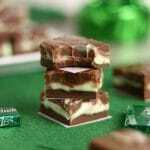 Dainty Brownie Teacakes – a made-from-scratch soft chocolate brownie drizzled with sweet, creamy almond icing. 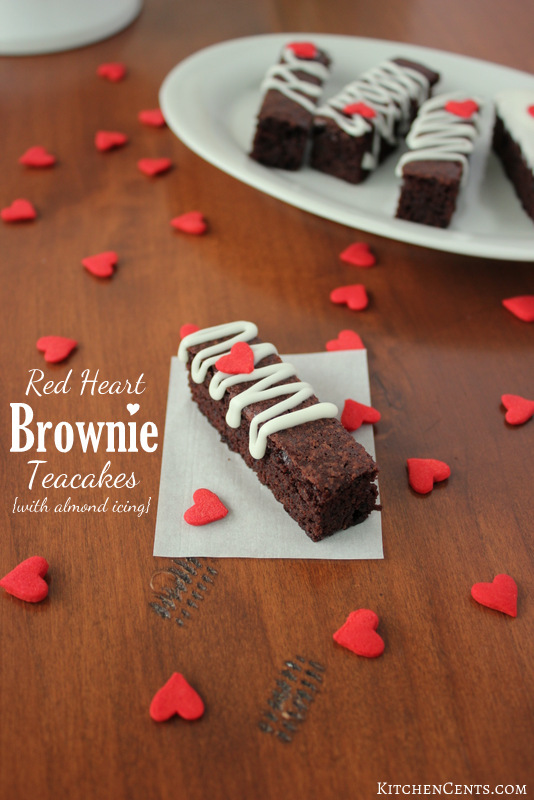 These dainty brownies are perfect for tea time or anytime! 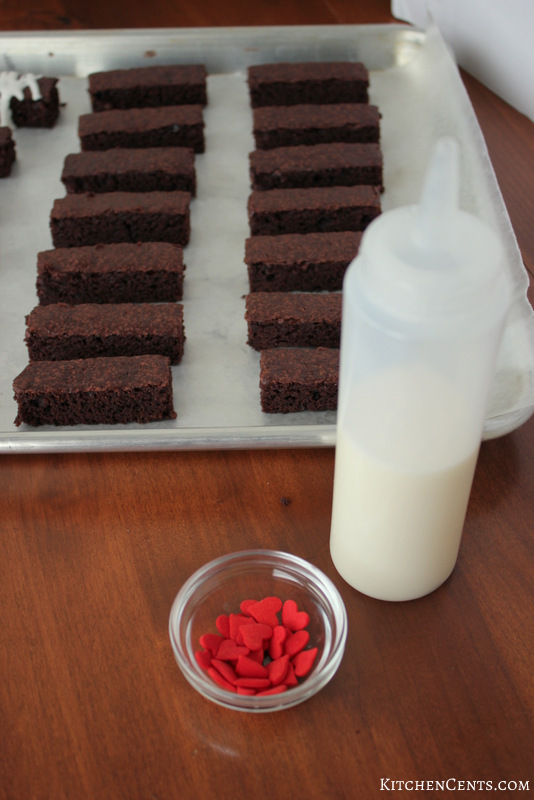 With Valentine’s Day right around the corner, this is a great recipe to make with your little ones or for your kiddos. It’s a fun, festive recipe everyone will love eating. Whether for Valentine’s Tea or mid-morning tea time, this recipe will bring the tea to any occasion. 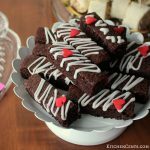 This amazing chocolate brownie is baked in a half sheet (cookie sheet), cut into finger-size pieces and drizzled with a super simple, delicious almond icing. Top it off with a cute red heart giant sprinkle and everyone will swoon at the sight (and taste) of them. They will be the hit of any party–especially a tea party! My oldest, LouLaw (check out my ABOUT ME page to learn more about us 😉 ), loves to play dress up and play tea party. Tea parties are a big deal in our home. With 4 girls 6 years old and under, tea parties are life! Haha. These little brownie teacakes are perfect for a tea party get together or party. Who are we kidding? 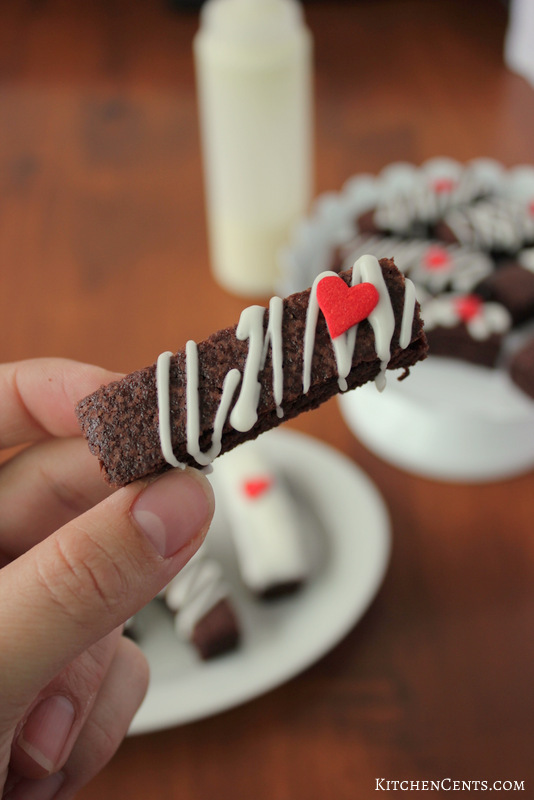 It’s chocolate brownies… these cute little finger desserts are great for any occasion. This recipe came about a couple years ago after suggesting to Lou that we should have a tea party. She, being 4 at the time, was thrilled at the idea of a tea party that day. “Oh, mom we can have apple juice for our tea”–because we don’t actually drink tea. “We can have little sandwiches.” As I, being almost as excited as she was, made a platter of tuna pinwheel sandwiches, dill pickles, strawberries, and cucumber slices, she handmade little invitations to give to each person she wanted to invite. Me, her, her two little sisters and daddy. It was the best! We still needed the perfect dessert for the tea party. I had made a batch of homemade cake-style brownies that morning to make these amazing Homemade Ice Cream Sandwiches. Why not cut these into little finger cakes… a teacake?! 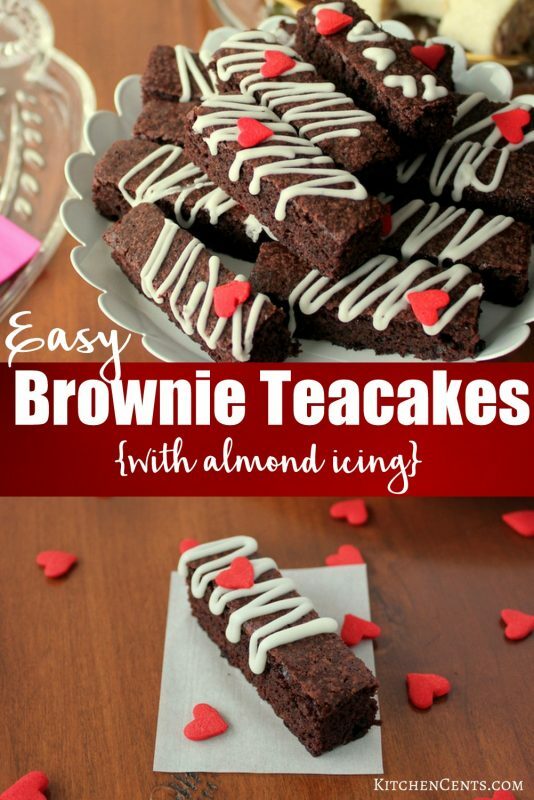 This brownie recipe was perfect for teacakes! We cut them into little teacakes, drizzle our super simple almond icing and added a cute little red heart sprinkle for a little Valentine’s cuteness. They were a hit for her and all of us! 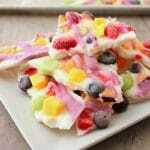 If you’re looking for a fun finger dessert especially around Valentine’s or for a tea party, you’ve found it! These Red Heart Brownie Teacakes with almond icing will be loved and gobbled up before you know it. HOW DO I MAKE THESE LITTLE BROWNIE TEACAKES? These brownie teacakes are easy to whip up. With a dense cake-like consistency, they hold up nicely. They’re chocolatey but not overly sweet so they pair perfectly with the sweet almond icing. They won’t crumble or break even though they’re cut into long strips. 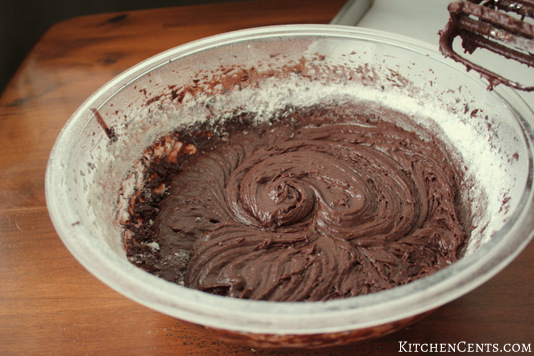 In a large mixing bowl, melt the butter then add the cocoa powder. I like to use Dutch processed because it has a darker, richer flavor. 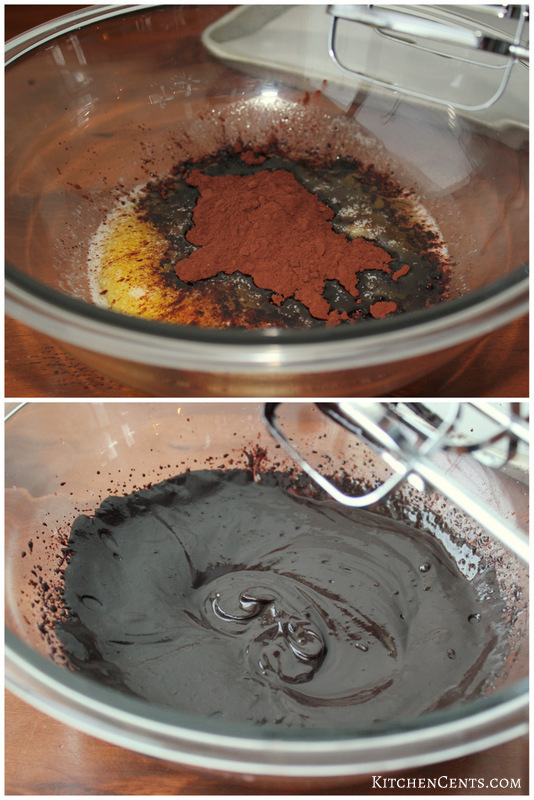 Once the cocoa powder is all mixed in, add the sugar. 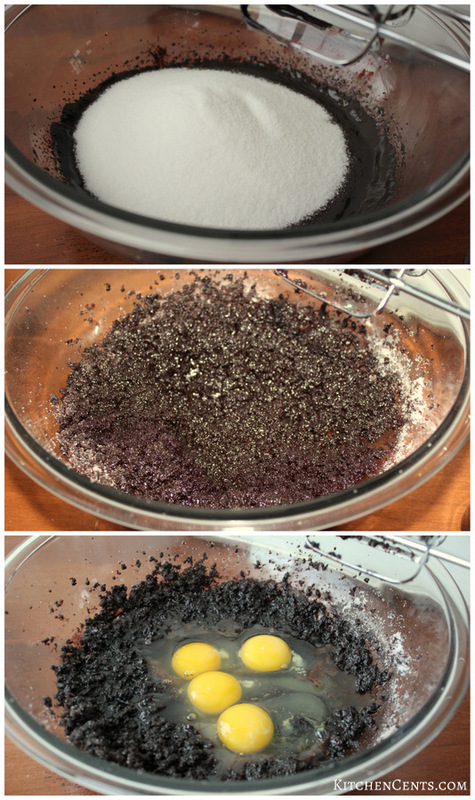 Once the sugar is incorporated, add the eggs. Beat batter until blended. It should be a fairly runny batter. Once the eggs are incorporated mix in the vanilla extract and vanilla yogurt. Next, add the dry ingredients (flour, salt, baking soda, and baking powder). PRO TIP: Mix only until the dry ingredients are incorporated. It will look something like this. 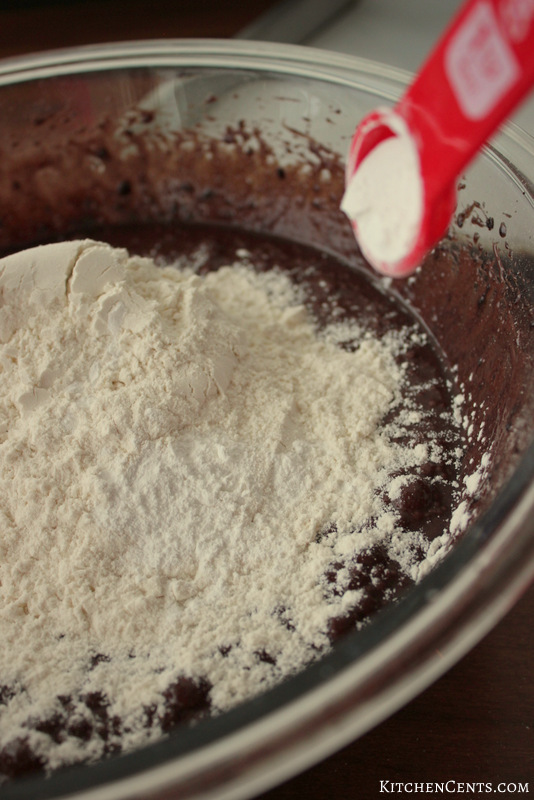 Overmixing will make the brownies will make them tough because the gluten in the flour will begin to form. You don’t want that. Not overmixing will make these brownie teacakes tender and amazing! I like to bake these brownies in a half size baking sheet. It makes the brownies about 3/4 to 1-inch thick which is perfect for a teacake like these. 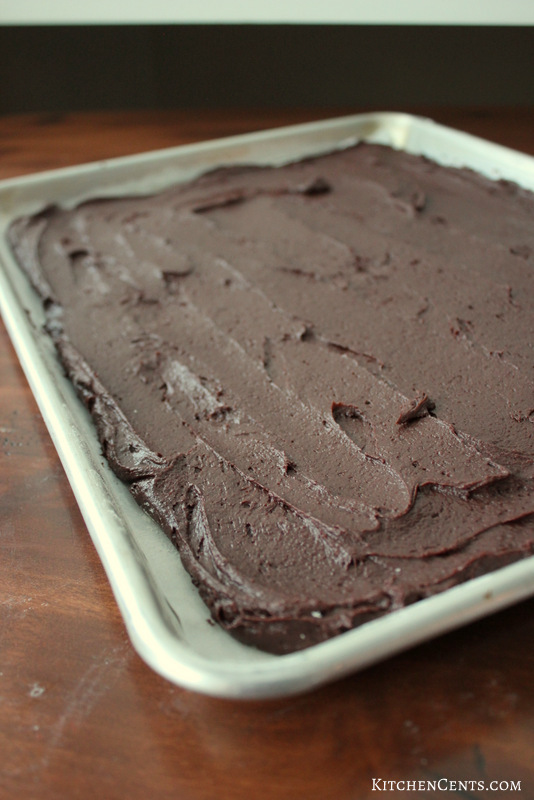 Once the batter is mixed, pour it out onto a baking sheet. I usually flour the bottom or use a silicone mat to help the brownies release when they’re ready to be removed from the pan. Next, spread the batter evenly over the pan. Here’s what mine looked like before it hit the oven. Lastly, bake the sheet brownie for about 20 minutes or until a toothpick poked into the center comes out clean. 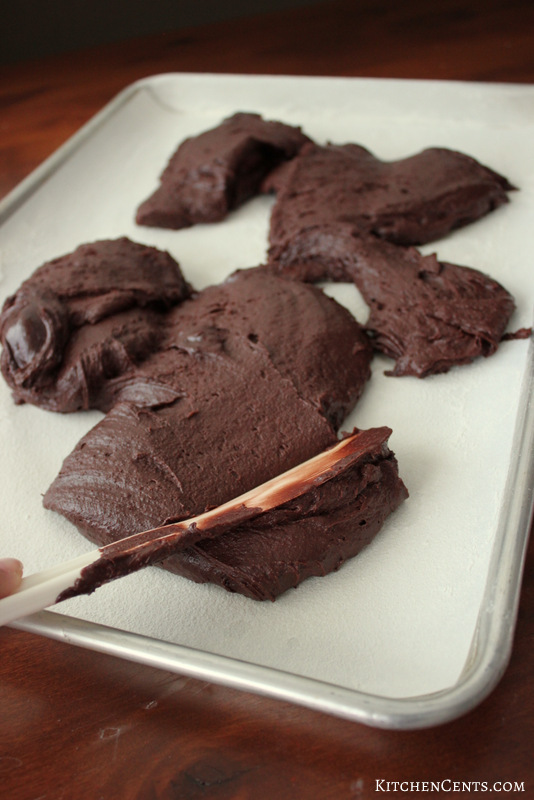 Let the sheet of brownies cool completely before cutting and adding icing. 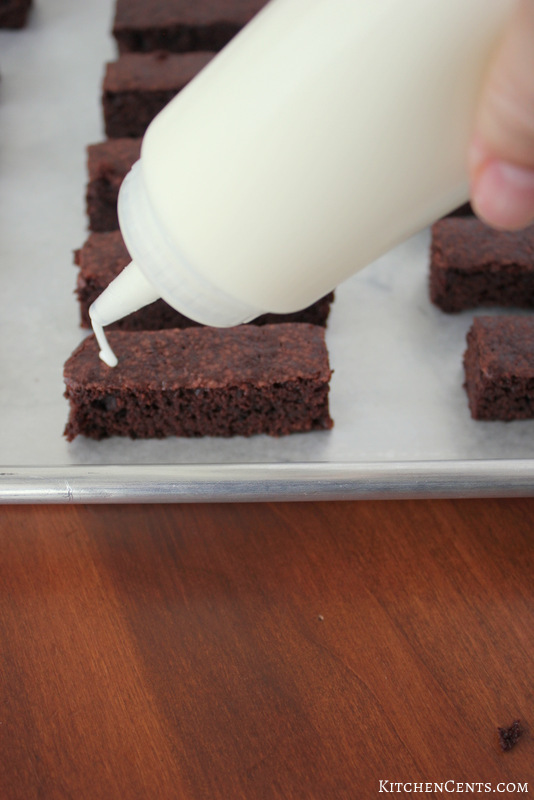 While the sheet of brownies is cooling, make the simple almond icing. In a mixing bowl, add powdered sugar, cream and almond extract. 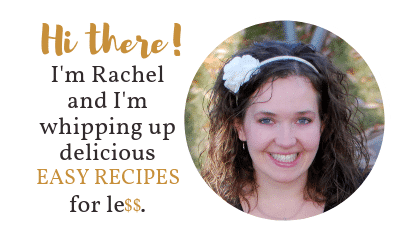 You can use regular or heavy cream. The cream won’t be whipped so the difference in fat content isn’t a big deal. Mix until all the sugar has been incorporated. If the icing is too thick, add an additional 1-2 teaspoons of cream at a time until your preferred consistency is reached. If too runny, add powdered sugar, 1 tablespoon at a time. You want the icing to drizzle off a spoon or be thin enough to squeeze from a bottle BUT you also don’t want it to ooze everywhere once it’s on the teacakes. I poured the icing into a bottle to make it easier to pipe onto the brownie teacakes. 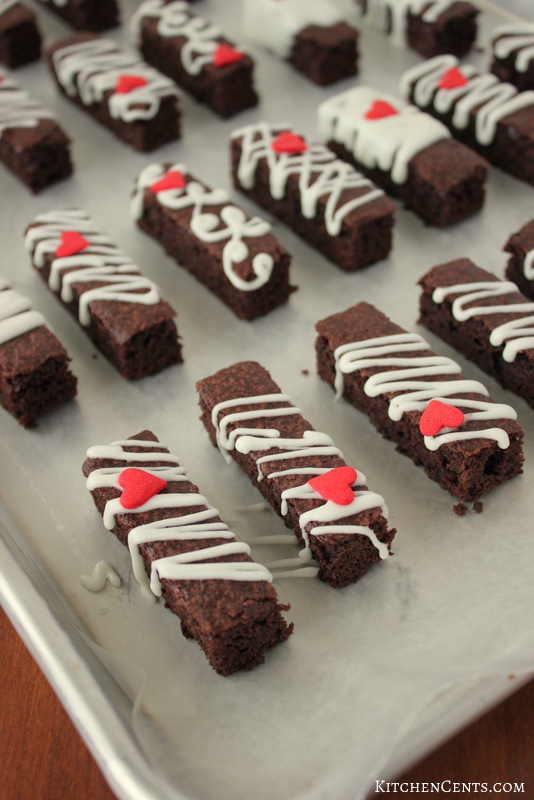 Once the sheet of brownies is cooled, cut them into 1-inch by 3-inch pieces. If you bake this recipe in a half size baking sheet and cut into 1 x 3-inch pieces, it will make about 90 teacakes. Now, for the fun part. 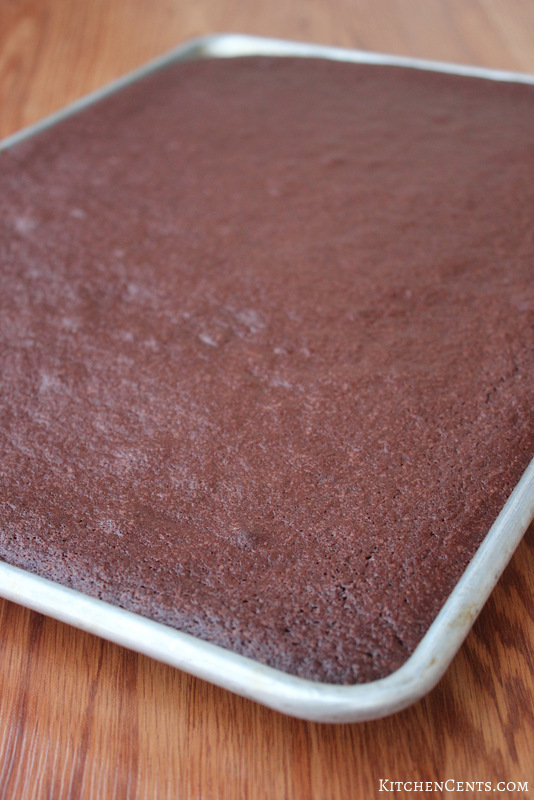 Place all the cut brownies onto a baking sheet lined with parchment or waxed paper. Drizzle or pipe the icing onto each teacake. Lastly, place one red heart sprinkle onto each iced teacake. The icing will act as a glue for the sprinkle. Let the icing dry a bit before moving to a serving platter. Aren’t they just so cute?! I just love to white, brown and red contrasting colors. It really makes these POP! When Lou saw the final tea party tablescape her giant smile and wide eyes said it all. <3 We had a fantastic tea party and enjoyed these cute little teacakes for dessert. Every last one of them! What do you like to serve for dessert at a tea party or brunch? A made-from-scratch soft chocolate brownie drizzled with sweet almond icing. 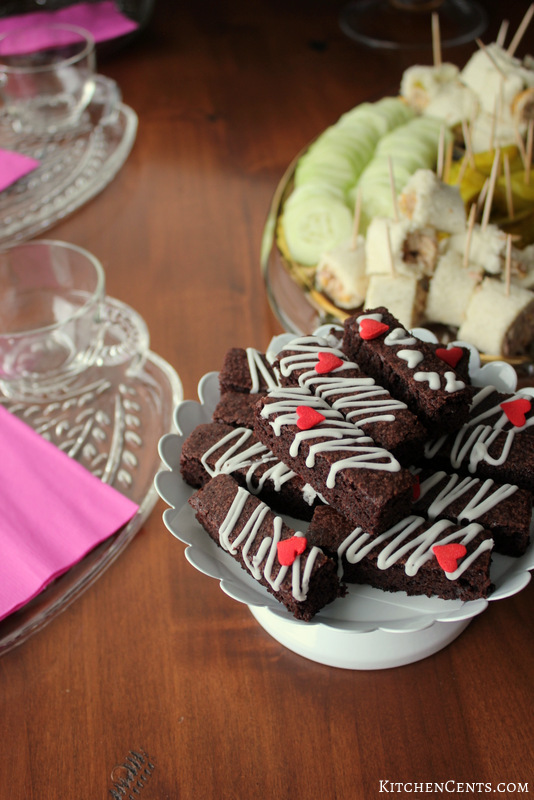 Dainty brownies perfect for tea time or anytime! 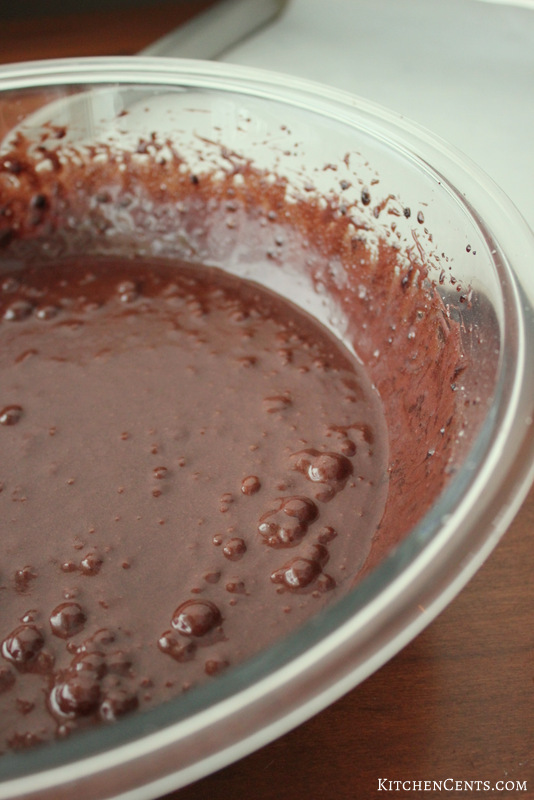 In a mixing bowl, add melted butter and cocoa powder. Blend. Next, mix in sugar. Once sugar is incorporated, add eggs. Add vanilla extract and vanilla yogurt. Blend well. Add, flour, salt, baking soda and baking powder. Only mix until blended. Do not over mix. Pour onto a half size baking sheet (cookie sheet and spread evenly. You may want to flour the bottom of the pan or use a silicone mat to avoid sticking and provide an easier release after baking. 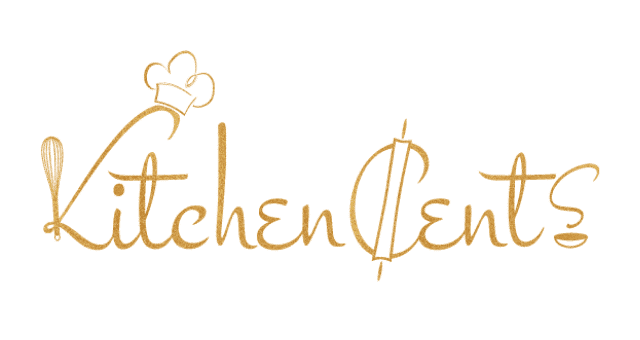 Bake at 350°F for 20 minutes or until a toothpick inserted into the center of the sheet comes out clean. 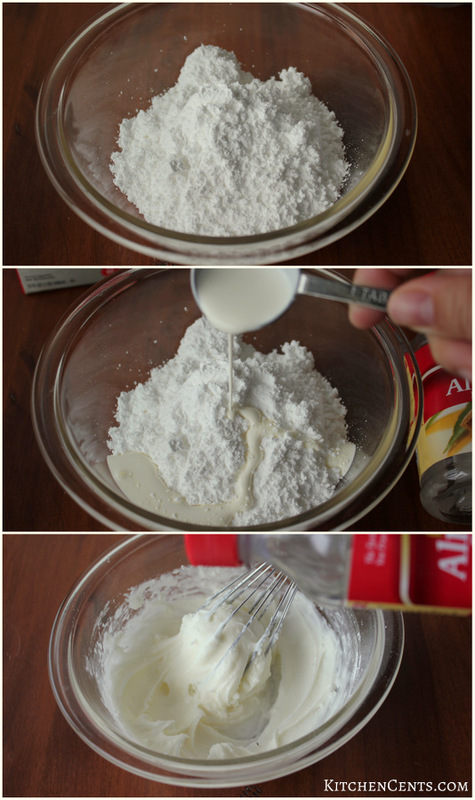 In a bowl, mix powdered sugar, cream and almond extract. If too thick, add 1 teaspoon of cream at a time. If too thin, add 1 tablespoon powdered sugar at a time. The consistency should be thin enough to drizzle off a spoon or squeeze out of a bottle AND not ooze off the brownie teacakes. Cut brownie sheet into 1 inch by 3 inch pieces. This recipe will make 90 teacakes if baked in a half size baking sheet (cookie sheet). Drizzle or pipe almond icing onto each teacake. Add red heart sprinkle to each teacake. Icing will act as a glue for the sprinkle. Let icing set a dry a bit before plating to avoid sticking or smearing. These are adorable, and they sound so tasty! Yum! These are so cute and would be so fun for a little tea party! I love having them with my nieces! Pinned for later! 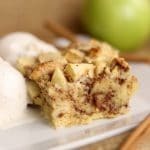 These look delicious and I love your presentation on a simple recipe! I want to make this for my husband for Valentine’s Day! I think he will love it! Okay, this is ADORABLE! I love it. It would probably be easy to make it a football for the superbowl too. I am so excited to try this. Pinning now! I’m not waiting until Valentines to make these. I’m definitely making these this weekend. Looks sooo good. Those look so yummy yet too cute to eat! I’d hate to mess them up! Lol! The decoration is so perfect! These look so pretty and delicious! Pinning! Homemade brownies are pretty much irresistible! At least to me they are. I think with the tea sie portion, I may be apt to eat even more! This looks very delicious and not too hard to make. I’ll have to try these sometime.